7/19/17, Review by BetterThanMost - Wanted to give an update on Crescent, as my review over 2 years ago was the most recent review. The club has new ownership and a new name in 2017. It is officially called The Revival At The Crescent. The new ownership has put a lot of resources into bringing the course back from the edge of death (see my previous review). I found all but one tee box in great shape. They were as lush as any I've seen this summer. The fairways as well, save the 6th, have finally recovered from the winter kill of '15. The weather has allowed the bermuda to thrive. The greens have never really been an issue at Crescent, other than the 3rd, and that is still the case. The greens were spongy underfoot and rolled pretty true. The club has done a lot of work on all green side bunkers. They have redone the drainage in the bunkers and added new sand to them. It appears as if they are letting several fairway bunkers that don't really come into play transition into grass bunkers. There are new carts with usb charging ports. Additionally, there were coolers of cold water at several spots around the course. Sprinklers had distances on them and their was new signage everywhere. The club still has work to do. The front half of the 3rd green has been transitioned back into fairway, leaving a really small target. It sits so far back in a wooded area, that I don't see any way they can get air back there other than bringing in fans. The 5th tee, green and 6th fairway also need work. They sit down in a low area and don't much airflow. The club never had complete cart paths, and while it wasn't a problem 15 years ago, the lack of maintenance of the dirt cart paths over the years has made them almost impassible. The edges of bunkers need to be worked on as well. Areas of the course that aren't directly in the line of play, but could see an errant shot are the last piece of the course to come back. All in all, the club has made great strides to make the course playable again. Continued efforts in that same vein will bring it close to the condition it was in during the mid-'00s. 5/31/15, Review by BetterThanMost - Wish I could dispute what others have written about Crescent recently, but I can't. I guess the first clue was pulling into the parking lot on a Sunday morning and seeing only a half dozen cars. Conditions from tee to green were quite frankly shocking. Tees, fairways, and rough with little or no grass on them. What grass was on them was random and unkempt. There was a notice posted in the pro shop from the Carolinas Section about how the late cold winter weather had severely retarded the growth of bermuda grass, and I'm sure that has something to do with it, but every other course in the area looks a lot better than Crescent. There were large areas of fairway grass in non-playable areas where the turf had been harvested and moved elsewhere. Where I don't know, because it certainly wasn't on the course. Some bunkers had sand, others were just dirt. Most had rocks and none of them had been maintained on a Sunday morning. The one part of the course that was above average were the greens. They were in great shape. Plenty of grass on them and not many ball marks (probably due to the lack of play). The one exception is the 3rd green. They've lost the front 1/3 of the green. They need to clear out a lot of trees or get some fans back there if they want any chance of bringing that green back. 5/6/15, Review by psychgunny - I have always enjoyed the layout at Crescent, but something has recently happened to the course conditions. Although the greens are coming back from a recent plugging, the fairways and tee boxes are all dead grass. At this time of year it should all be lush. At this time I would not be able to recommend this course to others. 5/3/15, Review by Yfzking69 - Very poor conditions!!! The tee boxes were very chewed up with little grass on them. The greens had aerations still from over two months ago and lots of sand on them. Very slow and inconsistent reads. The worst though is the fairways were dirt!! not grass, not dead grass but dirt!! The only reason they got a 1 star was because the sun was shining and beautiful day. The price was very steep for conditions. No more than 15.oo is what the price should be. 4/11/14, Review by aimtobreak80 - The back cover of the yardage book claimed that GolfCarolina.com had rated this course No. 4 on their Top 10 best Values of Charlotte in 2001. That might be a little bit of a stretch in 2014, but I did receive good value for the $22 green fee. The very strong winds (blew the ball off the tee several times) played havoc with scoring, but did not entirely ruin the outing. Course conditions were generally similar to those described in the March 14 review posted on this site with the exception of the greens which had been aerated since then. The little pock marks were still rather prominent, but didn't affect putting as much as the wind (moved the ball by at least 1 foot, on one occasion). A couple of considerations for those who have never played the course: (1) the fairways are rather narrow, however almost all of them are relatively straight with no major trouble (2) the cart paths may be best described as "rustic" ranging from concrete surfaces around the greens and tee boxes, to dirt and gravel (or no defined path at all)everywhere else, and (3) there are no relief stations, Port-a-Potty or otherwise, on the course and since it is located within an established community no "good" trees or the like are available either. As B-Man notes in his description of the course, it is somewhat remote for Charlotte golfers, and it is about a 35-minute drive for me, but I intend to try it again, in the summer, when (hopefully) fairways and tee boxes will be green and lush before I decide whether or not it is a good golfing value course. 3/14/14, Review by tvrepairex - Fairways brown like most courses.A lot of fairway traps have NO sand ,just mud.Most green side traps are good and raked.Greens are fast and most are smooth ,but a couple have some issues with bare(sandy )spots.Tee boxes average. 10/18/13, Review by DrSchteeve - Still a low cost gem. Great layout. Greens mostly near perfect (a few rough patches), fairways mostly good, teeboxes OK. Still missing cart paths on many holes. For $22 on a Friday afternoon and a good pace of play, hard to beat. 6/19/11, Review by rcubed3r - I still love this course, but is currently in the worst condition I have ever seen it. The greens are very nice as always, but there are lots of rough spots in the fairways and the bunkers are terrible. I hope they get is straightened out soon! With all that said, I still think their prices are reasonable and I will continue to play here when I can. 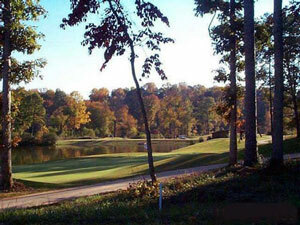 6/3/11, Review by DrSchteeve - This course should be in the "best cheap place to play" category. Greens in great shape, the rest of the course, not so much. But it is always like this - nice greens, fairways usually in fair to poor condition, bunkers atrocious, cart paths mostly nonexistent. Still, the layout is a lot of fun, good mix of easy and difficult holes, and the cost is usually very inexpensive. Have to say, though, that right now, for not much more, Eagle Chase is a much better course and in almost perfect condition. 4/8/11, Review by rcubed3r - I absolutely love this course. In my opinion, it is also the best deal in golf that I have ever experienced. We paid $22 to ride (normal twilight rate) on a Friday. It is a very nice, playable layout. Some sand, some water. Greens are in fair shape right now, but still just a touch bumpy from a recent aeration. The fairways are mostly dormant, but not hard. It will be in prime shape soon. I am seriously considering joining this club, but it is hard for me to justify considering how cheap it is to walk on and play. Take the time to drive to this course and try it out. I'm betting you'll like it! ...next time I drive 25 miles to a golf course, only to find out they had a shot-gun tournament about to start. Crescent did this to me last weekend. I had to come up w/ an alternative place & ended up at a course nearby(I won't mention the name, but they have a HUGE boulder painted white at the entrance). That was absolutely the longest round. Pro shop kept sending out 5-somes on that day for some reason. RIDICULOUS!! Has anyone played Crescent within the last two weeks? Just want to get an idea of conditions & how long ago they aerated greens. I played there today and the course is in excellent condition. Naturally, I played horrible but the greens are in mint condition and the fairways are nice as well. 6/20/05 - Played on 6/18. Had heard bad reviews recently, but I found no problems that affected my round. Greens were absolutely great, giving true and fast roll. The front nine has a few sparse tee boxes, but I hardly noticed. This is a fun course to play with great rates. Another good course. Another long drive to get there but well worth it if you've never played it. IMHO the best greens around. Quick but honest, not excessivly slippery, well groomed, will hold an approach shot. Bunkers are deep, probably the deepest around but have good sand and are placed to come in play with bad shots (as should be). Staff (clubhouse and greens) were friendly but found the other golfers standoffish. Who knows why... Plan on going back one more time in a couple of weeks.